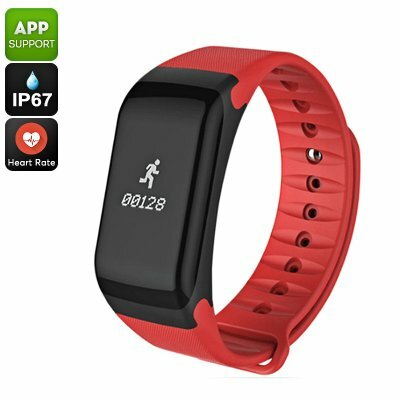 Successfully Added Fitness Tracker Bracelet - Heart Rate Monitor, Distance Counter, Pedometer, Blood Pressure, IP67 Waterproof (Red) to your Shopping Cart. A fitness tracker bracelet is a perfect gizmo for those of you who find it difficult to reach the recommended daily activity levels. This sports gadget features a pedometer which helps you keep track of the total number of steps you take during the day. It furthermore shows you the total distance that you have covered. With this information at hand, you’ll stay motivated to move more in order to increase your stamina and overall health. The fitness tracker furthermore comes with a blood pressure sensor and heart rate monitor. These features make it easy for you to check on your current health and stamina and allow you to adjust the intensity of your upcoming workout sessions accordingly. With a sedentary reminder in place, this sports bracelet makes sure you’ll never miss out your daily workout sessions again. The fitness tracker supports Bluetooth 4.0 and is compatible with both iOS and Android phone. When used with the dedicated mobile App, you’ll be able to easily analyze and compare your activity levels over a longer period of time. Additionally, your Bluetooth watch will also treat you to call and message reminders. Thanks to this, you’ll never miss out on an important update again while you’re in the gym or out for a run. With its IP67 waterproof design, this sports tracker can be used in any weather condition. Its sophisticated 80mAh battery treats you to 120-hours worth of usage time.